Bullying is in our schools, and now it’s online. Why do kids do it? What can be done to put an end to it? You cannot miss an “AC360°” special report in collaboration with Cartoon Network: “Stop Bullying: Speak Up,” starting Monday night at 10 ET on CNN. 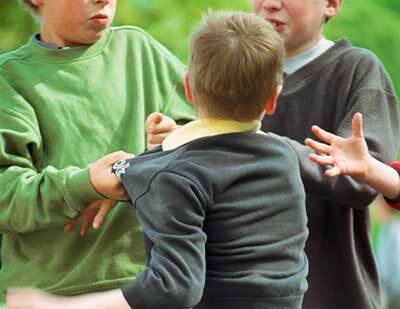 (Parenting.com) — It’s hard enough to learn that your child is being bullied — but what do you do if he’s the culprit? Getting that phone call from a teacher or another parent is shocking — and embarrassing — but it doesn’t mean you’ve raised a “bad kid.” It may mean, though, that your child’s in a self-esteem slump. Have you been told your child is a bully? When something bad happens that your kid can’t control — say, he loses a loved one or is ignored by a friend — hurting another child can empower him and restore his confidence. But that’s no excuse for bad behavior. Confront him. “Say, ‘Just as I wouldn’t let anyone hurt you, I won’t tolerate you hurting anyone else,'” advises Karp. Find out what’s going on at school. If his home life hasn’t changed, ask him how his classmates are treating him. You might learn he’s struggling to make and keep friends or that his friends are pressuring him to pick on another child. Remind him to say no whenever his friends want him to do something that could get him in trouble. Right the wrong. Come up with ways your child can make his victim feel better, likae apologizing in a letter or inviting him for a playdate.